Join the discussion on our forums! Come discuss Weapons Project over in our dedicated Weapons Project discussion topic. Harrison Jones was kicked off this project. Works great with Shield Slam and Reckless Flurry Also! such a flexible card! Great tool for warriors. Gain 6 amour, equip a weapon, destroy your opponent's weapon and, as Trump pointed out, you can play Harrison Jones straight after and draw 3 cards. Excellent card. No longer are you forced to run an Ooze, this card will destroy Twig, Skull of Minari and if you think it's worth, Aluneth. Twig and Minari are both control match ups that heavily rely on their weapon, and this belongs in the upcoming control warrior. Definitely huge leverage for warrior to always have a weapon break ready vs what are some of the best and most common control matchups, and it's not like its a useless card unlike ooze which cannot always work, this will always be useful in every matchup. At worst, you're giving aggro 6 armor that they probably don't need because they'll run out of steam soon enough. Maybe good if weapons are heavy in the meta as it can be a tech card, but I feel like I'll just stick to my Woodcutter's Axe otherwise. i want fiery win axe with "can't attack heroes " this card not good. Good on its own. Even better if paired with Harrison Jones! But it's simply nice to be able to break certain pesky weapons from my opponents without feeling obligated to add an ooze or Harrison to the deck because against decks that don't use weapons, they are nothing but a body that does nothing when entering the board. 3) That belongs to the museum anyone? 4) 2/3 weapon is not that bad. In all seriousness it's pretty funny how anti-aggro this is. It's playable, but it still hurts. 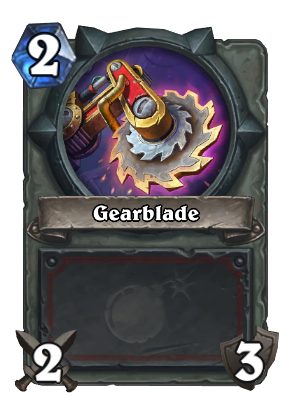 Fits the project cards' theme of helping your opponent somewhat while helping yourself greatly, a 2/3 weapon in most classes isn't that fantastic as they can't always sustain face tanking minions to keep the board and dealing 6 to the face is somewhat negated by the 6 armor gain, while warriors have innate weapon buff potential alongside cards that benefit from high armor count. I don't know that it's a ''good'' card but it's certainly one I like to see in the game. Still not a Fiery War Axe of old, but ok.
My weapon belongs in the hands of a master. Your weapon belongs in a museum. It looks interesting and it stayed this way while in play. 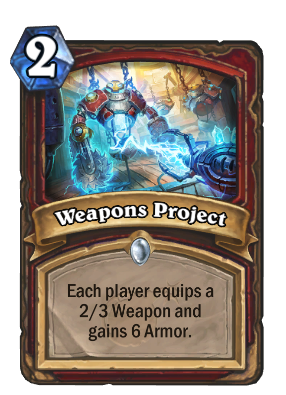 Warrior will be able to give this 6 dmg to enemy since all of those new armor gains cards are in the set. But will it gain the spot in viable deck? Dunno. Even if you're playing Taunts to block your opponents weapon, giving them 6 armor is not good. It actually doesn't matter either way you look at it. Armor vs control doesn't matter unless they can keep up the armor gain. Against aggro armor for them doesn't matter whatsoever. You at least get armor yourself and a weapon to survive against aggro. You can at least destroy Twig in druid, and play this with Harrison Jones. and give your opponent 6 armor.